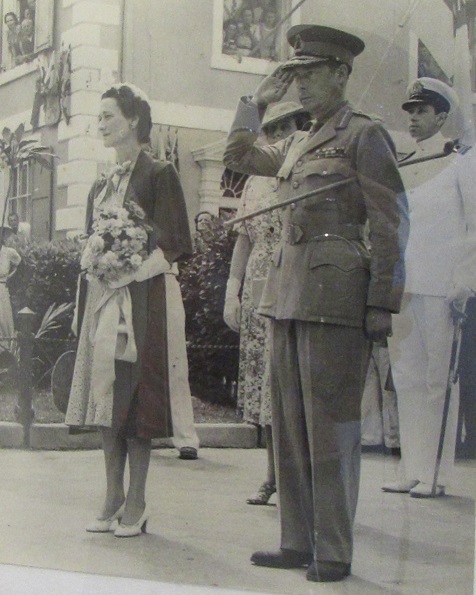 The British government’s dilemma during the early years of WWII: what to do with the capricious, Nazi-courting Duke and Duchess of Windsor (formerly known was Edward VIII and Wallis Simpson). Winston Churchill’s answer was to send them across the Atlantic where they couldn’t get themselves, or the British government, into trouble. That would be to the Bahamas, where Edward would be governor. “A third-rate British colony,” Edward groused, but he had no choice. He was governor of the Bahamas from 1940 to 1945. My friend Patricia wanted to spend her January birthday somewhere warm, so we went on a week-long cruise from the port of Baltimore to Florida and the Bahamas. Our first stop, after 41 hours at sea, was Port Canaveral, Florida. We opted for a nostalgic Disney World excursion there, so you won’t be hearing about that. But our stop the next day was Nassau, in the Bahamas. We only had 2.5 hours in Nassau. The ship was docked from 2 pm until 11 pm, so that’s 9 hours, right? But attractions and shops close at 4:30, so it’s really not. We could have gone to restaurants, or bars, or the Atlantis hotel mega complex, but we really had no interest. Plus, the last thing they told us before we disembarked was not to wander about after dark. What I wanted to see most was the National Art Gallery of the Bahamas but it is closed on Mondays, when we were there. So that left me with only one other must-see: the Heritage Museum of the Bahamas. The heritage museum is within walking distance of the port (as is the art gallery, for future reference) so, armed with a map, we set off on our own. We walked from the ship down Parliament Street and in about a block found Parliament Square. 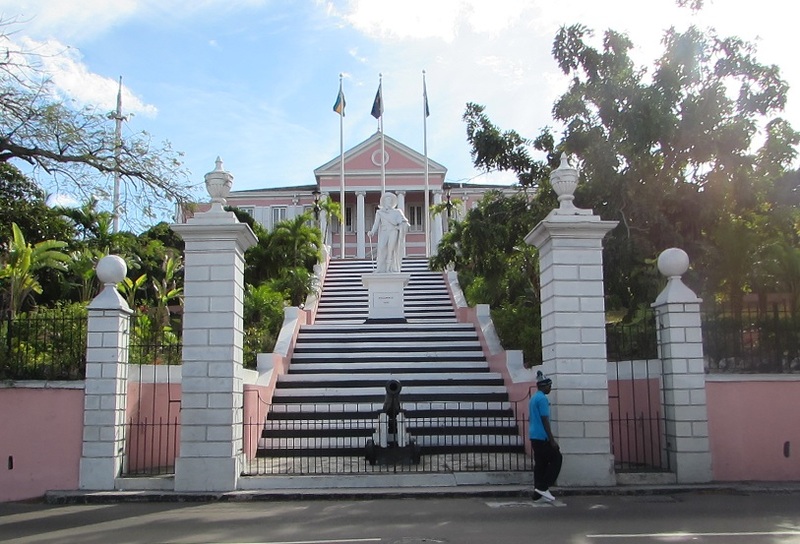 The buildings of the Bahamian parliament complex were built about 1813 and were based, according to the Bahamian tourist office website, on the old capitol buildings of North Carolina, in New Bern. I’ve never seen the ones in New Bern, but my guess is that they are not bright pink. That statue is of a young Victoria, erected in 1905. 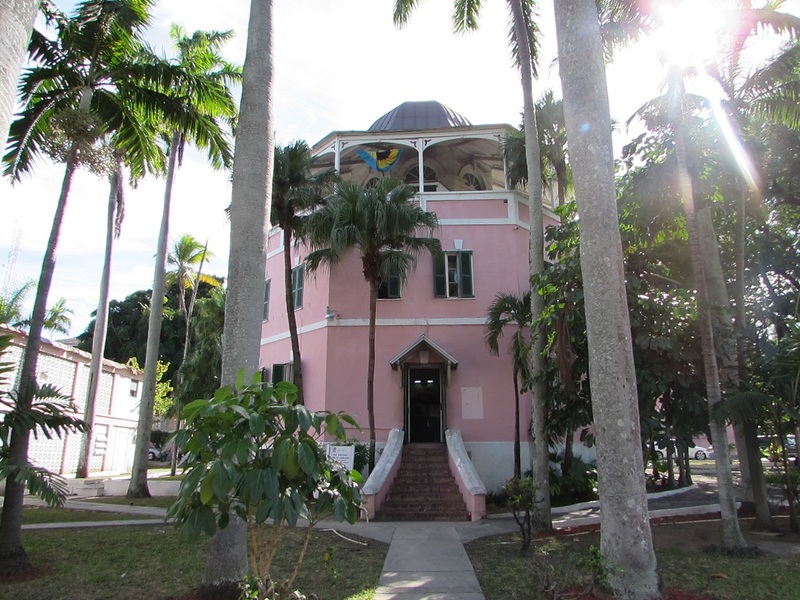 Also on Parliament Square is the Nassau Public Library and Museum, an octagonal building that started life as a jail in 1797. The museum part contains historic prints and documents but we didn’t go inside to see them because we didn’t think we had the time. Tripadvisor reviews say that there’s only about 15 minutes worth of viewing, however, so we could have. Unfortunately, streets weren’t always marked and soon thought we were lost. A woman clutching a Burger King bag walked by and guessing (correctly) that she was a local, we asked her for directions. She was able to tell us that we were exactly where we thought we were, but couldn’t get from there to where we wanted to be. The spur connecting East Hill Street (where we were) to West Hill Street (where the museum was), cut through Government House grounds and wasn’t accessible to the general public. That wasn’t at all clear on the map. She sent us down and around the grounds, and back up the other side. If we hadn’t done the down-and-around thing, we might have missed the statue of Christopher Columbus, in front of the house. 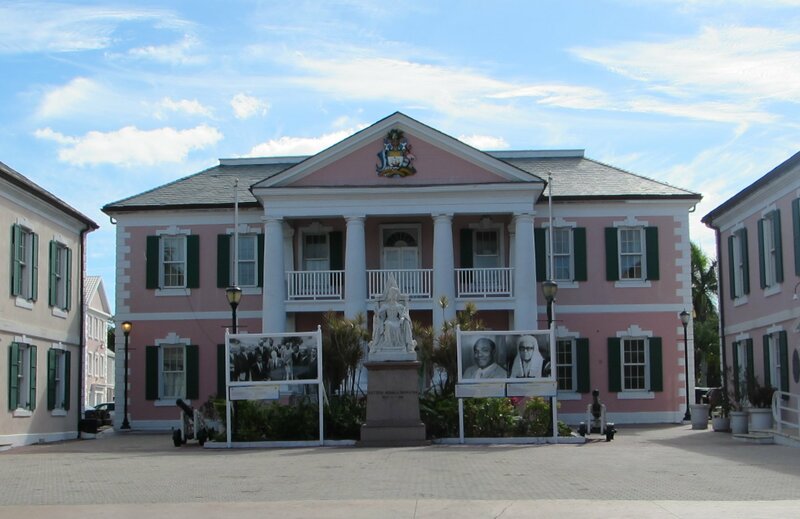 The origins of the statue are unclear, but it was placed in front of Government House by the then-governor in 1830. The Bahamas were inhabited by the Taino people when Columbus landed on one of the islands in 1492. He claimed it for Spain but Spain had no interest in it, except in its people, which they transported off the island and into slavery elsewhere. The Bahamas were unpopulated and unloved until 1783, when the Spanish traded (with the British) the Bahamas for Florida and the British, being a little more desperate for sun and sand than the Spanish, I imagine, settled there. Next up: we find the museum. Gallery | This entry was posted in Bahamas. Bookmark the permalink. I love the pink! It reminds me of the Olde Pink House in Savannah! Oh what I wouldn’t give for someplace warm right now – I walked last night in the rain, and today in a fine mist. I was so happy to get out of the cold and into the sun. I feel bad whining about it, because I know that New England is getting pounded in a way that we’re not. Still, happiness was basking in the sun. I just noticed all the buildings in my photos are pink. They actually had a wide range of colorful buildings. They are all pink! I’ve been whining about the rain, so whine away… I totally understand the need for some Vitamin D.
Thank you for the great trip and insisting that we see the history museum. You’re welcome. It was so much fun. Mention of Nassau always gets me thinking about James Bond! Not much of a James Bond fan, so had to look it up. I see that Nassau was featured in four Bond films. Must hunt them out because I love recognizing places I’ve been. I love the pink too! Wonderful contrast to the corner quoins and the traditional architecture. When I started my car yesterday morning, it said it was all the way up to 7 degrees. The snow is currently 45″ deep and it is snowing again. It is beautiful, and I am nice and warm, but Spring when it arrives is going to be very much appreciated!